Rodney Langham, a man living in a quiet suburban neighborhood in New South Wales, Australia is a very lucky man. At least, as far as marsupial mixed martial arts is concerned. 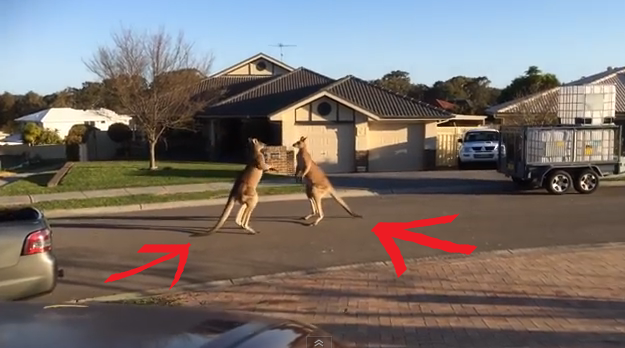 You see, Mr. Langham is among the few who was able to witness a rather wild and dramatic fight between two gigantic kangaroos in his neighborhood. Kangaroos are everywhere in Australia but you don't often see them slugging it out with each other. One sunny day, Mr. Langham was very surprised to see two kangaroos punching and kicking each other in front of his home in New South Wales. Fortunately for us, Mr. Langham decided to film the match and post it on YouTube so we can all watch and enjoy a lesser known side of the magnificent marsupials. For most of us, our knowledge of kangaroos revolves around three things. One, they can only be seen in Australia. Two, they have pouches where they carry their babies. And three, they are good hoppers. With this video, we can add a fourth bit of knowledge about them - they can fight. Kangaroos would engage each other in fights for a variety of reasons. It could be over a female kangaroo, over a drinking spot, or over a grazing area. Fights can last as short as a few seconds or as long as an hour.